Now with Full Color Printing on One to Six Sides! These Customized 18mm Transparent Casino-Style Dice feature your full color logo(s) on one to six sides of the dice. You can print photos, words and phrases, numbers, spots, or any design that you have in mind! Our 18mm Casino-Style Transparent Custom Dice are nearly casino size (3/4", 19mm), so the dice are great for casino night promotions, Vegas tradeshows, as giveaways, and much more. 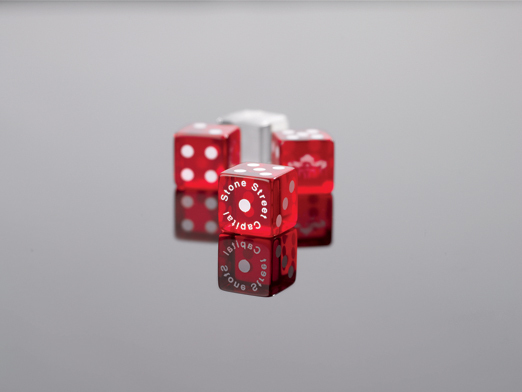 Made of a durable acrylic plastic, the Branded, Promotional Casino Dice come in your choice of Transparent Red or Clear.